Alabama Partnership for TeleHealth (APT), a charitable nonprofit organization, in partnership with the Southeastern TeleHealth Resource Center have recognized Medical AIDS Outreach of Alabama with the “Telehealth Champion of the Year” award for its exceptional dedication to furthering the use and knowledge of telehealth in Alabama. 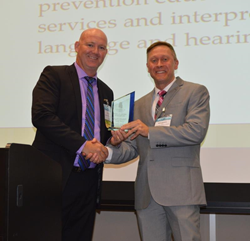 Medical AIDS Outreach of Alabama "Telehealth Champion of the Year"
The award was presented before nearly 200 telehealth industry colleagues at APT’s recent Fifth Annual Alabama Telehealth Summit, which took place on August 9, 2016, at the University of Alabama at Birmingham (UAB) Hill Student Center. This year’s conference theme, “The ABCs of Telehealth – Accessible, Beneficial, Cutting Edge,” brought together top telemedicine minds and key telehealth stakeholders in Alabama, including healthcare providers, IT professionals, telecom providers, hospital administrators, school-based health professionals, government policy advisors and medical mission group representatives. The annual event covered a wide array of telehealth topics that included updates on state regulations, trends in school-based programs and new tools to support successful operations. All Alabama Telehealth Summit conference presentations are available via the Global Partnership for Telehealth website. Click here to access this year’s presentation slides. Alabama Partnership for TeleHealth, Inc. (APT), a charitable nonprofit corporation, is dedicated to increasing access to healthcare through the innovative use of technology. APT strives to serve the citizens of Alabama by promoting and supporting new and existing telehealth programs across the state. APT’s umbrella organization is the nonprofit, Global Partnership for Telehealth, Inc. (GPTH) whose mission is to promote telehealth to underserved citizens not only in America but anywhere on the globe. GPTH’s unparalleled success in applying telehealth programs and services has resulted in the provision of cost effective, efficient, and high quality healthcare for hundreds of thousands of individuals from rural communities in America to orphanages in Guatemala and Afghanistan. For more information, visit the GPTH website at http://www.gatelehealth.org/. The Southeastern TeleHealth Resource Center (SETRC) is one of 14 TeleHealth Resource Centers (12 Regional and 2 National) funded by the federal Office for the Advancement of Telehealth through a grant program to provide support and guidance to TeleHealth programs. Our mission is to serve as a focal point for advancing the effective use of TeleHealth and support access to TeleHealth services in rural and underserved communities in the southeastern region of the United States. We have extensive TeleHealth experience and can provide services, resources and tools to both developing and operating programs.